2014 was launched with a very special experience, the passing of my lovely Aunt Rose Mary, after a long illness … just 5 days into the year. As such, I’ve been in a thoughtful state this past month, as my family and I come to terms with her passing, each in our own way. Part of my way is to write, share and pass along lessons learned. I am a spiritual person and I had that in common with Rose Mary, having an opportunity to discuss our beliefs before she made her transition. Both of us are/were in the helping professions (she as a nurse with many varied experiences including maternity, emergency, hospice, psychiatric and group homes). And I as a coach and business mentor, who increasingly works at very deep and personal levels … discussing aging, legacy, death, and multi-dimensional experiences with my clientele (it puts the business coaching we do into its proper perspective). 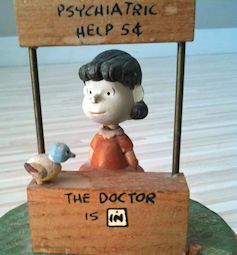 One of my most cherished possessions is this Peanuts music box she gave me when I was around 7 (Lucy charging 5 cents for psychiatric advice, what a deal!). My Mom recently informed me that a colleague gave it to Rose Mary who in turn gave it to me. I’ve always thought she saw into my soul things that would eventually play out in my life – that she foresaw the route that my life would take, even way back then. And I loved/love her deeply for seeing me so clearly and for being a supportive champion my whole life. I had the opportunity to write Rose Mary’s obituary and to further expand upon her life story by creating a “Memory Map” for her recent Celebration of Life gathering. In my working life, it’s a privilege to map History Maps, especially Life Maps for individuals (it’s a move in my SHIFT-IT Visual Coaching System). However, creating this Memory Map for my loved one upon the occasion of her passing, was a DEEPLY moving and precious experience. And the hardest map I have ever done (given the fear of making a mistake, and concern about how others, also in grief, would respond). 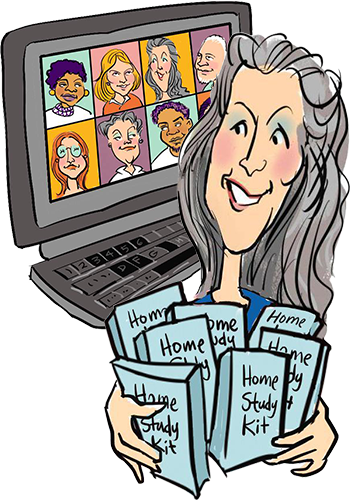 The first step in creating the Memory Map was to gather the general info of Rose Mary’s life. Significant dates (birth, school, nursing graduation, marriage, children’s birth dates, moves, jobs, travel, etc). The second step was to contact family, friends and colleagues and ask for memories they would like to share (indicating how they will be used — i.e. they will be compiled onto a mural that will be used at the Celebration of Life). People won’t necessarily understand what that means, but they share in good faith anyways. 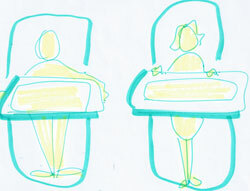 The third step was to determine the size and layout of the mural. In this case, I decided on a simple journey/landscape motif, working left to right (and creating separate bands for memories (top area in blue), milestones and travel (middle area in purple) and work and geographical moves (lower area in brown). 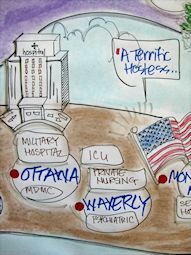 The size was determined by the size of my Neuland Graphic Wall (15 feet), which would house the mural at the Ceremony. 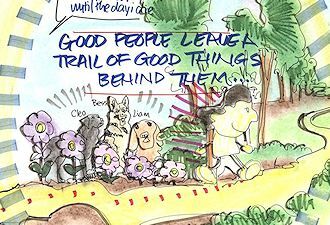 For color, I opted for mostly cheery, bright and uplifting colors, as despite Rose Mary’s health challenges, she lived a full life with rich experiences (and I wanted the color tone to connote that and to help uplift people viewing it). 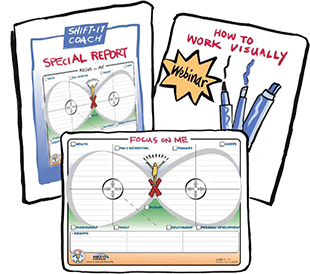 One of the most difficult things to do in Interactive-Visuals work (whether its studio or live creation) is to draw something that others know well. When I encounter things like that, I usually research actual photographs and if it’s a studio project (like this mural) I’ll project the photos (with an old fashioned overhead transparency projector) rather than doing everything totally free hand. My uncle Mike, Rosemary’s husband, is a talented photographer so I had the advantage of great pics from their travels together. When I create a mural of any sort, it’s not something I usually do super quickly (as my creative process takes time, it’s a sort of slow dance). This mural took an especially long time. If you are the person creating a Memory Mural for a loved one, be prepared for it to take much longer than any of your usual work. Like any map, I have a different relationship to the initial content after I have spent days creating a visual depiction of it. In this case, I had an enhanced relationship to my adored Aunt and her life by having the honour of creating her mural. It’s a deep, delicious, touching, sometimes sad integrative process. Be gentle with yourself and take your time – you are working on multiple levels of body, mind and spirit. And viewers of your map will be processing on multiple levels too. 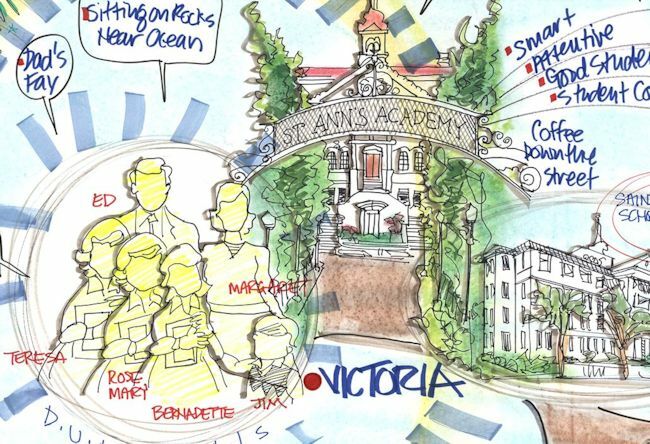 A Memory Map used in the context of a Celebration of Life is a family affair. I’m sure circumstances vary just as families do – however its my thought that its important to involve others in the creation of the mural to aid in their own integration process too (and not have all the pressure on you to make decisions). And to discuss ahead of time how the mural will be used onsite. Murals can be discreetly off to the side, or, in our case, used front and center … as a backdrop to the main eulogy and to public story telling. We also opted to interactively involve those present, by including little ‘people cutouts’ that folks could use to write their name on, and place on the timeline where they first met her. The range in our family varied from a Great Aunt in her 90s (from the generation of Rose Mary’s parents) to a caring palliative care worker who met her in her last months. In closing, I would like to express my thanks and love to our beloved Rose Mary for the supportive role she played throughout my life and for the profound experience she brought to me, through the creation and sharing of her Memory Map. This experience has touched me on a deep level that is part of the current SHIFT I am going through … as I enter the back nine of my life. For me, this kind of sacred application of visual skills epitomizes the depth and juicy range of Interactive-Visuals work. And I know I now have another powerful Guardian Angel on my side to assist me on my unfolding journey.